Ms. Chrisette Michele. I read your open letter to basically black people about why you are singing at Trump’s inauguration. While I applaud your words, I think you may have forgotten that is what minorities always have to do. We are constantly building bridges whether we realize it or not. We have had to constantly build bridges especially when we have so many that want us to fail. For every good we have and every level of civil unrest we have done, there is always someone who still maintains in their mind of what the stereotypes of minorities are. When we march, we are told to keep still. When we silently protest, we are told to show respect. We are constantly being bombarded by what we are supposed to be doing. How there is an actual difference between “good” blacks and “bad” blacks as if every ethnicity doesn’t have its own rotten fruit. These days people are emboldened to tell the truth about what they do or will do. We have seen racists basically spew their bile all over everyone just because somehow they were being held back by political correctness. If you honestly wanted to build this bridge, then why no meeting with Mr. Trump at one of his supposed towers? He seems to have time to meet with anyone that isn’t government related. If you are doing this for a check, then say so. 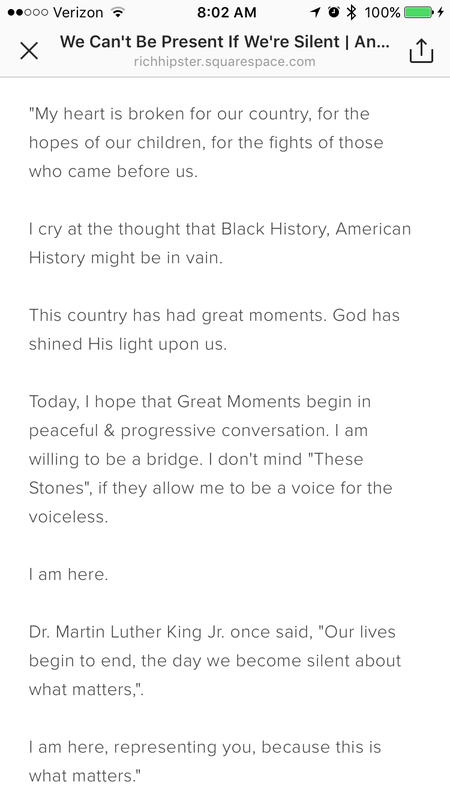 If this is what you honestly feel you are building bridges, then I am going to figure that you will be conversing with his resident outreach of black affairs director Omarosa to make things better for black communities. I myself am tired of the olive branch extending for those whose minds stay closed and have shown themselves for who they truly are. “When people show you who they are they first time, believe them. Previous Post Hello. It’s me.